Growing up in Buffalo, New York in the 1970’s I had many friends of Italian ethnicity. But none were Tyrolean. Usually when someone asked if I was Italian, I just gave in and said “Yes, yes I am”. Because how can you explain to someone that your heritage is from a country that you can’t find on a map? Let’s jump ahead to 1991. Something on the nightly news catches my attention. Hikers have found a man frozen for over 5,000 years in the Alps … the Tyrolean Alps! Something awakens inside me and I proclaim to my husband, “Look he’s a Tyrolean, just like me! The iceman is one of my ancestors!” At the time my husband thought I was a little crazy. But there was a spark of recognition that, yes indeed, I did come from an ancient people. Today we know this man as Otzi – The Iceman and he is a treasure to the people of South Tyrol. 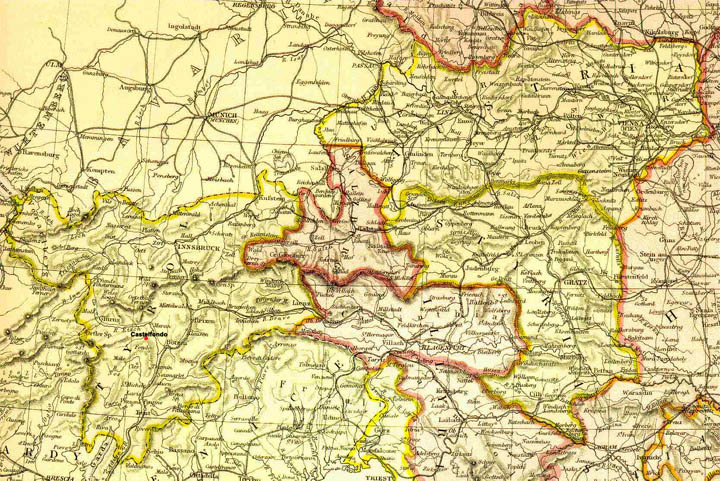 Map of Austrian Tyrol drawn in 1882. Portions of these regions now belong to Italy. Thankfully we live in the age of the internet with answers right at our fingertips. In 2010, it didn’t take long to solve the mystery of my ethnicity. Apparently the region of Tyrol is smack in the middle of Europe. Because of its central location, the fact that it is land-locked with several bordering neighbor countries and that it guards important mountain passes between eastern Europe and southern Europe – this area has been invaded and controlled by many tribes, countries and governments throughout history. Human settlements in Tyrol can be traced back to 12,000 BC. Otzi is a mere 5,300 years old! Yep, we’re talking ancient! 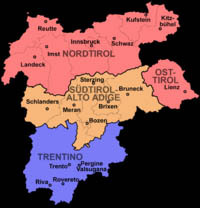 Modern Tyrol today – Pink areas belong to Austria; Orange area is the province of Alto Adige or Sud Tirol (South Tyrol) and belongs to Italy; Purple area is the province of Trentino and also belongs to Italy. We’ll save the long history of Tyrol for another blog post. For now the short answer of modern ethnicity is that Tyrol belonged to the Austrian Habsburg Dynasty, (that later became the Austro-Hungarian Empire) for about 550 years. There was a short period of rule in the 1800’s under Napoleon in which the country was given to Bavaria, then later returned to Austria. After World War I, the Austro-Hungarian Empire was dismantled and the region of Tyrol was divided with the southern portion given to Italy. 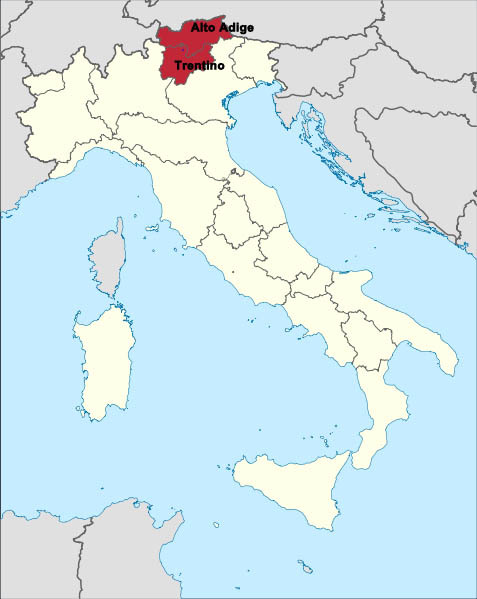 By 1919 this area became the Italian provinces of Trentino and Alto Adige (or South Tyrol). The little Austrian village of Castelfondo, ancestral home of the Genetti family, was now Italian! So there you are – the Genetti Family is of all three ethnic backgrounds: Tyrolean, Austrian and Italian. I will always consider myself to be Tyrolean and from the same beautiful part of the world where Otzi, The Iceman once lived. Read more about the History of Tyrol, click here. Find out about the famous Tyrolean, Otzi – the Iceman as the South Tyrol Museum of Archaeology, click here. Glad I found this blog. I had the same problem as a child, teenager but in different location – South America.